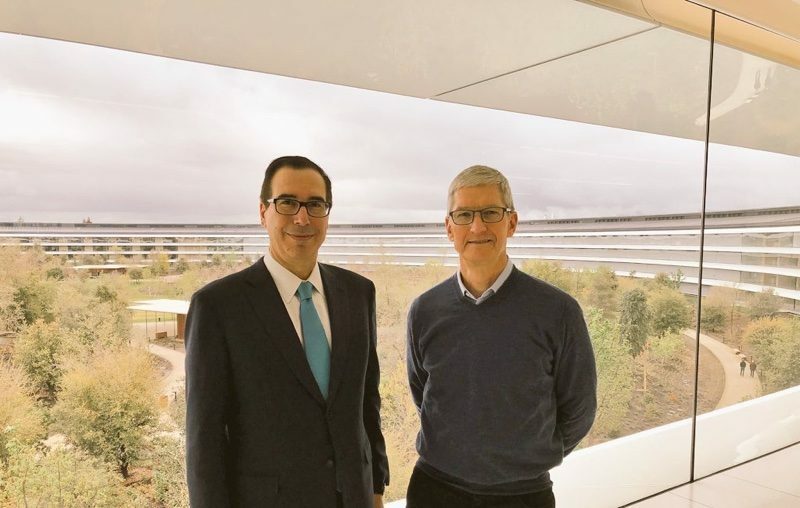 United States Treasury Secretary Steven Mnuchin today visited Apple CEO Tim Cook at Apple Park, according to an image shared on Twitter by Mnuchin. In his tweet, Mnuchin thanked Tim Cook for Apple's commitment to invest $350 billion in the United States, which refers to a January announcement from Apple where the company said it planned to bolster the U.S. economy through job creation, existing investments, and new investments. Apple said it will contribute $55 billion to the economy in 2018 and $350 billion over the course of five years. At the same time, Apple also pledged to increase its Advanced Manufacturing Fund, designed to create jobs in the U.S. through investments in suppliers, to $5 billion, up from $1 billion. Mnuchin's visit to Apple Park comes just a few days after Tim Cook was spotted at Capitol Hill meeting with senators Mark Warren (D-VA) and Richard Burr (R-NC). I sure hope he didn’t walk into one of those glass walls and lacerate his smug face. That sure would be a shame. This dude Mnuchin is so corrupt, and I can't believe people let him use our tax dollars the way he's been using them. My god he’s so disgusting. Never has this country had to endure such an embarrassment of an administration. Tim should be used to the layout by now. I hoped Mnuchin talked to Timmy about important stuff like updating the Mac Mini line. They did, but Timmy went "What's a computer?" mode. For the record "Apple’s direct contribution to the US economy will be more than $350 billion over the next five years, not including Apple’s ongoing tax payments, the tax revenues generated from employees’ wages and the sale of Apple products." So, yes Apple is going to contribute about a half a trillion dollars to the economy in the next five years and does include direct investments. Thanks to the tax reform, 42 billion alone will be going directly into the US Treasury. Hundreds of billions more will be put in the pocket books of their employees and contractors to spend and invest in the US economy. The tax reform program is undeniably putting trillions into our economy. LMAO!!! It’s all going on the national credit card called the deficit. Please share some of your kool-aid with the rest of us. The “for the love of god please don’t try to shake my hand you pale, clammy creep” expression on Tim’s face says it all.